I usually put a link to the great documents available at Footnote.com at the beginning of each post in this series. 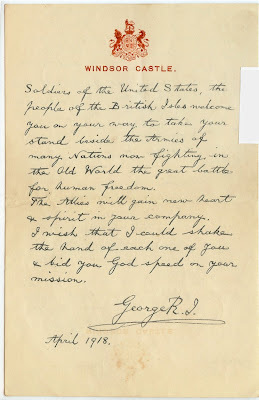 I try to find something pertinent to link to, such as collections from World War I. Today I was stunned (happily) to find that the folks at Footnote have placed documents of the US Expeditionary Forces to Russia online! Where did these come from? I hadn't seen them yesterday! How exciting! So after you read this latest post, I hope you'll join me in reading about the ANREF at Footnote! We are all feeling fine. This is a greeting from his Majesty King George. This sure beats everything that I ever took in. There is no end of new and queer sights. I would like to write the name of the cities that we see but can not. It would be censured. This is sure some city believe me. The band is playing american pieces it makes a fellow lonesome for America. We settle and move so often that we hardly know where we are But write according to my address above. Every thing looks favorable. That is all I can say. Now mother do not worry. For we get plenty to eat and feel good. Will have worlds to tell you some day. The signature in the bottom left corner is "Dwight Fistler, 2nd Lieut". It also appears on the front of the envelope's face, seen below. Unfortunately, this envelope was scanned with part of the magazine article sitting on top of it. All these pieces were being stored in sleeves, and that is how they were scanned. 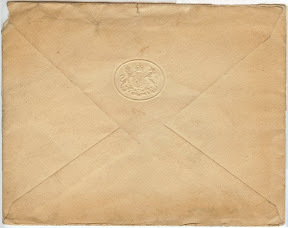 You can see in lieu of postage, the words "Soldiers [sic] Letter" appear in the upper right corner of the envelope's face. I suppose the return address probably said something along the lines of "A Message to You from His Majesty King George Vth." Directly below Bryan has written once again his address. The addressee is "A[ngelo] M[errick] Robbins, 1612 Mystic Ave, Muskegon Hts, Mich, USA," Bryan's father. Bryan's comment that "this is sure some city" makes me wonder if this was written from London. A family story has been handed down through the generations, from Bryan to my grandfather Bob, to my dad (also named Bryan) who told it to me: Apparently Bryan and a buddy were out and about seeing the sights of the city when a commotion was heard. "The King is coming!" "Bow, the King is coming!" Down the street came the King (was he in a carriage or a motorcar?). Bryan and his friend knew that Americans bow to no king; however, they wished to be respectful and were in uniform, so as the regent approached, they saluted. King George V leaned out his window and returned the salute to the young men! Truth or legend? While we'll probably never know for sure, I'm fairly certain there was some sort of truth at the base of it. There usually are in family stories. View American Milestone Documents for free at Footnote.com. And we won't come back 'til it's over Over There." In late July 1918, the 339th Infantry, to which Bryan was assigned, was sent by train from Camp Custer, Battle Creek, Michigan to Camp Mills in Nassau County, Long Island, New York. Second Lt. Hugh McPhail of Company A (Bryan was in Company I) shared in his memoirs that the train first stopped in St. Thomas, Ontario for a much-needed stretch of the legs and beef sandwiches and coffee. Swinging by Niagara Falls, the troops went on to Hoboken, New Jersey and took a ferry across to Long Island, arriving at the camp in the late evening (whether this was a one- or two-day trip is not clear). According to an excellent historical website on Camp Mills, it was one of four staging areas for the Port of Hoboken. The other three were Camps Dix, Merritt, and Upton. Today, Camps Mills and Merritt (Bergen County, New Jersey) are housing developments, and Upton (Suffolk County, Long Island, New York) is Brookhaven National Labs. Camp Dix later became Fort Dix (Burlington County, New Jersey), still continuing in operation. Upon arrival, Bryan would have been fed, and given a card to fill out and mail home, assuring his family that he had arrived safely. For obvious intelligence reasons, no information would be given to the soldiers about where they were headed. On Sunday morning, July 21st, the troops were marched down to the ferry and then embarked on the U. S. S. Plattsburg, a merchant ship that had been commissioned for troop transport. Originally christened the Harvard, she had been built in 1888 in Glasgow, Scotland. She had already served a commission with the U.S. military during the Spanish-American War in 1898. Since then, she'd been decommissioned, refitted with new engines, and then recommissioned by the U.S. Navy for use until 1919. In 1922, she was renamed the New York, but was scrapped in Genoa in 1923. Originally, she probably looked like this depiction in a photo postcard, but probably had this camouflaged painting as shown here, during her troop transport service. Once on board, the troops were ordered belowdecks, where they were to remain until the ship was out to sea and out of sight of land. For two weeks they zigzagged across the Atlantic, avoiding enemy submarines, until they arrived in Liverpool on August 3rd. From Liverpool, they rode by train over 200 miles to Camp Aldershot (nicknamed "Camp Cowshot" by the Yanks) in Hampshire (the south of England), where they stayed for three weeks. According to Lt. McPhail, it rained nearly every single day. It was here the men of the 339th got whiff of a rumor that, instead of going to France to fight the Huns, they might get shipped to North Russia, as being Midwesterners, "they were used to the cold, anyway." By now, it was mid-August and someone decided to clothe the soldiers in good long-john underwear in preparation for the cold Russian winter ahead. They were taken out on one of the few sunny warm days for a ten-mile hike, which must have been loads of fun wearing long underwear in the humid English climate! I know that many readers tend not to click on links in blogs, but I highly recommend that you do so on this post. I found fascinating descriptions of the history of the places mentioned, along with historical photos and postcards, all of which I would have loved to use to illustrate this post. Copyright prevents me from doing so, so please check out the links. They will give you a better overview than what I've been able to do of the sights and experiences the men of the 339th--many of whom had never until then left their home communities--would have had on their trip from Michigan to England. Yesterday I spent an enjoyable three hours online in the company of Jasia and the footnoteMaven, while we busily scanned photos for Scanfest. Jasia was scanning family photos from her childhood, Maven was scanning orphan (unidentified) photos found at antique stores, and I scanned about a third of the black-and-white photos in one of my wedding albums, in preparation for my Wedding Memory Book to be published by MemoryPress. Although Craig wasn't able to join us, he did mention in his last post that he had his own personal Scanfest going. It's nice to know that Scanfest is inspiring people to get their precious family and ancestral photos and documents scanned and preserved. I hope you can join us for the next one, Sunday, August 26 from 11 AM - 2 PM, Pacific Daylight Time. DearMYRTLE highlighted an article in today's Muskegon Chronicle which encourages those of us with Muskegon County, Michigan roots to share our family stories for the publication of a county history being created by the Muskegon County Genealogical Society. With ten ancestral--and dozens more collateral--surnames of my family tree taking residence in Muskegon County from at least 1879 to the present, I could submit a ton of information! However, only one family history of no more than 400 words and one photo are allowed free entry into the book. There's no information on the costs involved if you would like to submit more than one family history. Let's see, I could do the following groupings and submit five family histories (if they allow this): HOLST/GUSTAVSON/CONCIDINE; ROBBINS/KIMBALL; LEWIS/VREELAND; HOEKSTRA; and WILKINSON/SAYERS. Wonder how much that'll cost me? I'm off to e-mail the genealogy society...! This Sunday, July 29th, from 11 AM - 2 PM, Pacific Daylight Time, I will be hosting the July 2007 session of Scanfest. If you've been following T.K. 's "Tidy Your Documents Month" over at Before My Time, you're sure to have a nice little stack of documents and photos needing scanning. Let me tell you: I certainly do! I can't say that I've gotten organized overnight, but in beginning to sort and analyze the papers documenting my paternal grandparents' lives, I found lots of great clues for further research and uncovered some details I had either not known about or forgotten. In addition, I received three CDs of scanned photos and documents from scrapbooks belonging to my grandfather's sister, most of which were about her parents (my great-grandparents). I've been having a blast putting all this information together in date order and sharing it with my readers and family members. One of the other things I've done is to remove original certificates, documents, and photos from some of these file folders, scan them, and place them in acid-free, archival safe sleeves. They are currently in a binder, waiting to be moved to my newly-leased safety deposit box at my financial institution. I've hole-punched genealogical and historical newsletters and placed them in binders, and I've cleared out a couple of "to be filed" piles. There's still a long way to go (it's a journey, not just a destination! ), but I'm chipping away at it, a little at a time. So back to Scanfest: I've got a list of items to be scanned, especially things from my ROBBINS grandparents' and great-grandparents' file folders, as well as an album full of my wedding pictures in preparation for the memory album I'm working on over at MemoryPress. I hope you'll join me for these three hours and we can chat about what we're scanning, researching, cooking for dinner, planning to do on our next vacation, you name it! Now, I'm really hoping you'll join me! June's Scanfest was a bit of a bust, which is why I never got around to blogging a report. The footnoteMaven was kind enough to join me for about a half an hour, but then needed to go. Nobody else showed up! :-( Then there was an issue with my computer, which needed to be dusted out with compressed air. That took my husband about half an hour to do a full service job on it while I chatted on my laptop, unable to scan anything! I know a lot of people are on vacation this time of year--and for others, Sunday afternoons are reserved for family times. BUT, if you mark it on your calendar and IF you have some free time, I'd love to visit with you! And hey, you'll be doing your descendants a big favor by getting some of your "stuff" scanned and organized! The English version of GeneaSofts is launched! I first created the French version of the GeneaSofts website in September 2005 and it immediately became very popular. GeneaSofts is the only one website on the net that gives daily news on genealogy softwares, web-based user interfaces and other genealogy tech news! I have developed my own tools and alerts to trace all software releases and new softwares, from the unknown to the best seller. An update of the site has been done -- for the last four months -- to let you see how interesting, useful and efficient GeneaSofts is. Regular author for La Revue Française de Généalogie, the #1 genealogy magazine in France. Web developer and in charge of the Anglo-Saxon partnerships for GeneaNet, free collaborative database since 1996. Upload pictures and records, and link them to any individual of your online family tree, etc. Hope that you will enjoy GeneaSofts! View military documents at Footnote.com. From Muskegon Heights, Muskegon County, Michigan, my great-grandfather, William Bryan ROBBINS, was sent southeast to Camp Custer in Battle Creek, Calhoun County. Camp Custer actually lies right at Calhoun County's west border with Kalamazoo County. General George Armstrong Custer is one of Michigan's native sons, and although he is most famous for his unsuccessful battle at Little Big Horn in Montana, he had built up quite a reputation for himself during the Civil War. Camp Custer was built in 1917 to accommodate the training of what would eventually be 90,000 Midwestern troops heading to Europe during World War I. At the end of the war, it was used as a demobilization base for over 100,000 men. Many soldiers, Bryan included, passed through the camp twice: once on their way to war, and again on the way home. This was the home of--among others--the 85th Division, originally called "The Custer Division," but eventually taking the nickname "The Polar Bear Division," because of its service in the American North Russian Expeditionary Force. 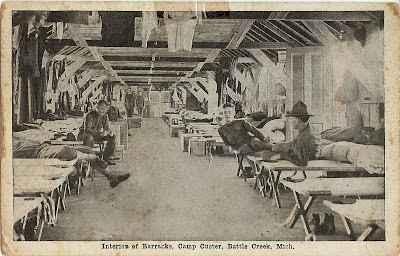 During the early 1920s, the predecessor to the Veterans Administration, the Veterans Bureau, established the Battle Creek Veterans Hospital, whose grounds contained 200 acres that were farmed by staff and patients. In 1940, Camp Custer was designated as Fort Custer, becoming a permanent military base. Over 300,000 World War II soldiers were trained there, including my paternal grandfather, Robert Lewis ROBBINS, and his brother, Bill, Jr., sons of Bryan. The fort also housed 5,000 German prisoners of war. In 1981, the Fort Custer National Cemetery was created, with opening ceremonies on Memorial Day 1982. The official address for Fort Custer is Augusta, Michigan, a small community just to the west of the base and located in Kalamazoo County. To the one, you know, loves you. You can click on the image above to read the article in full in my Picasa Web Album. It is rather long. In the Picasa view, click on the magnifying glass icon in the upper right hand corner to zoom in for an easier read. 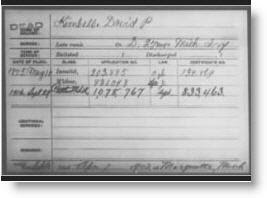 View your ancestor's Civil War Veterans Pension Index card. My distant cousin, Terry Wantz, and his colleague John Braden, put together a book compiled of biographies and obituaries of Civil War veterans of Newaygo County, Michigan. They later uploaded the information to the Internet at the Newaygo County Historical Archives site. 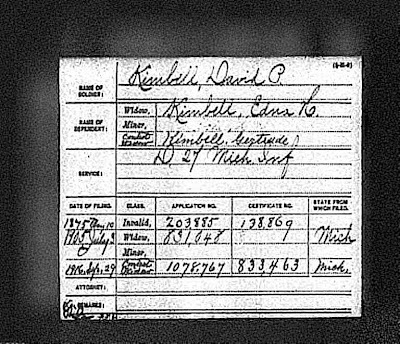 An account of the exploits of my 3rd-great-grandfather, Benjamin "Henry" KIMBALL, his brother David P. KIMBALL, and their friend Orson DAVID can be found about two-thirds down this page. According to this account, the three young men left the village of Fremont and headed south to Grand Rapids in Kent County to find work in the Spring of 1864. Their search unsuccessful, they enlisted in the Army, were sent to St. Johns, Clinton County for training, and were then assigned to Company D of the 27th Regiment Michigan Volunteer Infantry. As it was near the end of the war, they took part in some of the hardest-fought campaigns, including Vickburg and the capture of Petersburg. Orson was captured and was imprisoned first at the infamous Andersonville Prison, and later at Wilmington, North Carolina, where he died. Henry and David survived the war and returned to Newaygo County. Henry married Lucy May DICKINSON, who gave him four children, dying shortly after giving birth to my great-great-grandmother, Mary May "Lula" DICKINSON. (For those of you following my series about my great-grandfather, William Bryan Robbins, in North Russia at the end of World War I, this was his mother.) Lucy's sister Mary (DICKINSON) WEAVER raised little "Lula," with her own five children, and Henry remarried almost immediately to Mrs. Lydia DORWIN, a widow, believed to be Orson DAVID's sister. Henry's brother David first married Edna NORTHRUP, had three children, and after being widowed, married Edna's sister Mary who bore him five more children. I had found burial information online for these two brothers--they were buried in Maple Grove Cemetery in Fremont--but I could not find where they had died. Henry's burial information stated he died in 1924; David in 1903. Looking at Newaygo County death records turned up nothing. Neighboring Oceana County death records were not filmed by the Family History Library, and I decided to wait to order death certificates from that county clerk, especially not knowing for sure they had died there. Locating them in U.S. Federal Census records in the census years before their deaths was not helpful. The first difference I noticed was that the word "DEAD" was stamped in the upper left-hand corner of both Footnote cards. And what do you know, their death places (and David's death date) were listed on the bottom of their cards! Eureka! Alba, Michigan? I had never heard of it! I went to RootsWeb's U.S. Town/County Database and plugged in the location. Alba is located in Antrim County...what in the world was Henry doing there? To my knowledge, there were no extended family members living there. Newaygo County is in the West Central area of Michigan, while Antrim County is further north, not too far from the upper tip of the lower peninsula...just east of Grand Traverse Bay. And Marquette is in Marquette County on the north side of the upper peninsula, on the shore of Lake Superior! I never would have guessed these were their death places in a hundred years! So of course I am now left with the question of why these two were in those particular communities at the times of their deaths. Perhaps ordering their pension files from the National Archives will solve those mysteries. As I was preparing for my presentation "Finding Volunteer (and Low-Cost) Researchers Online," I remembered that Random Acts of Genealogical Kindness, my number one resource on my syllabus, has recently announced a partnership with WorldVitalRecords.com, using its social networking site, Family Link (still in beta). Taking another look at this site, I realized that to fully round off my presentation, I had better offer a tutorial for using this site in addition to my syllabus, and promised my fellow EWGS members that I would write one up here on my blog. When you go to WorldVitalRecords' home page, http://www.worldvitalrecords.com, choose the link in the top menu bar for Family Link. If you are already a Family Link member, you can choose to Login in the upper right corner of your screen. Otherwise, you will need to register for this site (don't worry, it's free!) by entering your first and last name and e-mail address and clicking "Get Started for Free." You will then be prompted to through a Profile set-up process: gender, birthdate and location. You are asked to give correct location information (which can be hidden from other members), so that you can "perform distance calculation between you and other members and search for location based events." At this point, you can also choose to upload a photo of yourself. The next screen is really the heart of the volunteer lookup portion of this social networking site. You can choose to show your genealogy background to everyone, or just your contacts, as well as list the number of years you've been doing genealogy and whether you will do local records (from your home location) or Internet lookups for others for free, for a nominal fee, for an hourly professional rate, or not at this time. Other information you may wish to choose to list are databases you have access to, family history software you use, your heritage, genealogical societies you belong to, languages you speak or read, and surnames you're researching. Keep in mind you can list as much information as you would like, or none of it. The next step asks you to invite your friends to Family Link; you can choose to skip this step. You can then check over your settings and save your information. Another choice you have is to write a biography about yourself and decide who may view it. You also decide how much (if any) contact information about yourself is available to others, such as phone numbers, instant messaging user names and your personal website. What I like about all this is that you are completely in control of what information you wish to list, as well as with whom you wish to share it. Once you're finished, click on Profile > Edit Profile from the top menu bar. My Research Places is listed in the lower right side of the Edit Profile page. You can add as many or as few research places as you'd like. Under the More > Research Cities menu in the top menu bar, you can then browse locations to find others researching the same areas, as well as to find others who are willing to help you with your research in those locations. Going back to the Profile > Edit Profile page, on the bottom right side of the page it also lists Events. This is a place where you and others can list family reunions, workshops, and other genealogy-related events. There are many other features on this website, including adding a family tree, creating ancestor pages, finding friends and meeting other people. I encourage you to check out the various features and utilize the ones that fit your needs. I really like this social networking site, and that's saying a lot, as up until now I haven't found one I really have cared for. The clinchers for me are the ability to connect with others researching the same locations, finding others who can assist me with my own research, and having an opportunity to give back to the genealogical community by doing lookups for others. 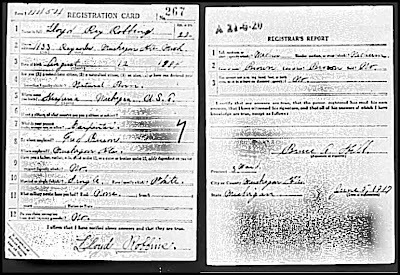 On 5 June 1917, my great-grandfather, William Bryan ROBBINS, registered with his local draft board in Muskegon Heights, Muskegon Co., Michigan on what was coincidentally his 21st birthday. He was living at 1130 Reynolds Street and employed as an "automobile repairer" for Muskegon Auto Company in neighboring Muskegon. This would have been three months before meeting his future wife Marie at her grandfather's funeral, when he worked as a chauffeur. I wonder if he worked both jobs simultaneously. His brother Lloyd also registered on the same day; in fact, his registration number is one before Bryan's, and on his registration card it states his address as 1133 Reynolds Street. Lloyd was working as a carpenter in Muskegon Heights for Fred Dominie (more on Fred in Part 9). Lloyd's registration card leaves me with some questions. I wonder if his address was written in error and should be number 1130, instead? 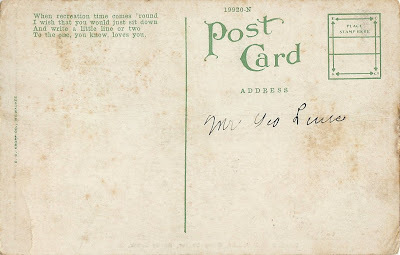 Near the close of the war, Lloyd writes to Bryan from home and says, "We are building some houses just east of our house on reynolds [sic], and we are going to move over there in a short time, so it will be like old times again." 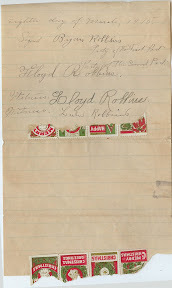 When Bryan applied for his marriage license in December 1919, he gave 1130 Reynolds as his address. My other question is regarding Lloyd's middle name. It looks like it could be Ray, but the image is blurry. 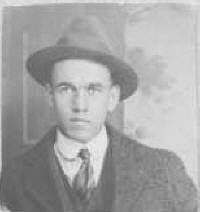 Lloyd and Bryan had a cousin, Arthur "Roy" Robbins, who also served in WWI. I wonder if Lloyd's middle name is actually Roy, not Ray. I also would like to discover more about Lloyd's service in WWI. I know he served in a machine gun corps with the 32nd Division in France, but that's the limit of my knowledge, and my initial attempts to find out more have been unsuccessful. 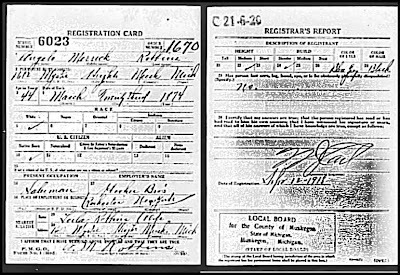 For the record, the young men's father, Angelo Merrick ROBBINS, Sr., also registered for the draft on 12 September 1918. At the time, he was a salesman for Hoekie [Hocker?] Bros. of Rochester, New York, and lived at 1612 Mystic Avenue in Muskegon Heights. You will, therefore, report to the local board named below at Court House, Muskegon, Michigan, at 4 P. m., on the 23rd day of June, 1918, for military duty. Thursday morning I had to drive clear across town to drop my son off to meet with his math teacher. He will be an eighth-grader next year, and is taking an online math course this summer so that he can skip ahead two grades to take a sophomore math class next fall at my daughter's high school. His math teacher is teaching a summer school class at the high school on the South Hill of Spokane, about six miles from our home, and had some time to be available for Q&A and assistance with his graphing calculator. Matt had a little more than an hour to work on his lesson, so I thought I would take the time to visit the Southside Family History Center to see what kinds of materials they had available in their facility. We are lucky to have four FHCs in our county, and each one is unique as to the types of microfilms and microfiche they have on permanent loan, depending upon what records their patrons are researching and have ordered from the Family History Library in Salt Lake City. In the 45 minutes while I was there, I wrote up two pages of notes, chatted with the volunteer on duty, and took a look around the facility. They don't appear to have microfilm scanner/printer software set up on a computer in tandem with a microfilm reader, like the FHC that I usually patronize on the Northside, although they did have several manual readers. They did have a good number of computer stations, more than the Northside does, but many of them were older models. They had a nice selection of books, including passenger lists and immigration indexes. I used their card catalog, organized by country, state or province, and county to see what microforms were available for my areas of research, and was very excited to see they have a large selection of Ontario county records for specific areas I'm researching, as well as some of my ancestral Michigan and New York counties. My son has two more sessions with his math teacher next week, and I plan to return for an actual look at the microfilm, along with my laptop and file folders, for in-depth referencing. Later that evening, I planned to go to the Northside FHC to work on some lookup requests that had come to me through Random Acts of Genealogical Kindness, when I received a call from the FHC director, notifying me that the microfilm I had ordered only the previous Thursday, had arrived from Salt Lake City that afternoon! We were both very surprised, and I was so excited! Normally, it takes two or three weeks--sometimes more--before I get the microfilm I've ordered. And I was eager to take a look at this microfilm roll, which included the city directories for Grand Rapids, Michigan from 1875/76 through 1879/80. Thanks to Jasia's series, I had gotten enthused all over again to do research in city directories, and decided I would like to have more of these microfilmed records on permanent loan at my local FHC for ease of referral for whenever I discovered a new branch of one of my many Kent County surnames! My earliest ancestors in the City of Grand Rapids were the TON and VanKLINKEN families, parents of one of my great-great-grandmothers, Jennie (TON) HOEKSTRA. Immigrants from the province of Zeeland, the Netherlands, they had moved to Grand Rapids by 1873 after first spending about 16 years in Cincinnati. Peter, the father, died the following year, and in 1875, Maria, the mother, married a widower with two children, Dirk BYL. Besides Jennie, Maria had two or three other daughters that survived infancy. In the 1873/74 and 1874/75 city directories for Grand Rapids, I had found the TON family, first on Taylor Street and then on Brainerd Street. Looking at the 1875/76 city directory, I did not find either a TON or a BYL family, even though I looked for alternate spellings. Both the 1876/77 and 1877/78 directories, however, listed a "Derk Byle," laborer, who resided at 96 Brainerd, and the latter listed John VanKLINKEN, Maria's brother, a laborer residing at 351 Taylor. Actually, the 1875/76 directory was of no help, at least at first glance. None of my surnames I looked up appeared that year. The jackpot came in the 1876/77 and later directories, although I ran out of time to look at anything past 1877/78. The 1876/77 directory included a Kent County rural directory, which had my CONCIDINE, HIGBY, McDIARMID, and TUINSTRA families listed! I also found the household of Beene STUIT at 321 First Street, Grand Rapids, in 1876/77; he was the husband of Catherina DEKKER, my great-great-grandfather Martin HOEKSTRA's half-sister. I can hardly wait to go back and discover more! EWGS Internet Education Class: "Finding Volunteer (and Low-Cost) Researchers Online"
Every third Saturday of the month, with the exception of December, Eastern Washington Genealogical Society members can attend members-only computer classes held in the Gates Computer Lab of the Downtown Branch of the Spokane Public Library. Various members take turns presenting the information in three hour-long class times which can accommodate 15 people each. Today's presentation was supposed to be on Animap, but the instructor fell ill. Playing a bit of musical chairs with the schedule, I volunteered to present my topic, "Finding Volunteer (and Low-Cost) Researchers Online," which I had already had practice presenting at the March LDS Genealogy Conference. In my class, I will carefully explain that there is definitely a time and place for hiring the expertise of a certified, professional genealogist, and that this information is not to be used in place of such services. But sometimes we simply need an extra hand or one or two records looked up. In these cases, finding a quality volunteer or low-cost lookup researcher can be indispensable! Genealogy is one of those areas where volunteerism works at its best! If you would like a copy of my syllabus, please contact me. My e-mail is available by clicking on the "About Me" section (see right-hand menu). 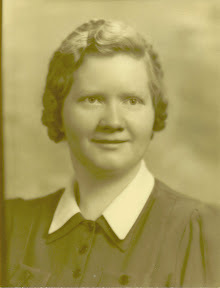 In March, I posted a biography of my maternal grandaunt, Barbara Dorothy VALK, a missionary for 38 years in Africa. I mention her here because she was named for her maternal grandmother, Berber "Barbara" J. DeJONG, and in comparing the photographs of the two women, favored her in her looks as well. with grandson Gerritt John Heidema, Jr.
My 2nd-great-grandmother's background is a bit of a mystery to me. Unlike my many other Dutch-Frisian ancestors, I have not been able to find her birth records listed in the wonderful online resources that the Dutch national government (Genlias) and the Frisian provincial government (Tresoar) have made available. Her death certificate gives her birth as 9 April 1858 in the Netherlands, and information found on U.S. Federal Censuses tends to mostly agree. Her death certificate also lists "Sjerd DeJONGE" as her father, mother's name unknown. The informant was Barbara's eldest daughter, Jennie (VALK) HEIDEMA VanderWAL. The earliest record I have for her is her name on the passenger list of the ship, Surrey, which arrived in New York City on 2 June 1882. She is listed on page 7 as "B. deJong," directly beneath that of her fiancé, "T.j deVal(k)," Tjamme "James" Wiegers VALK. This couple was extremely difficult for me to find in Ancestry's New York Passenger Lists database. I have never before nor since seen Valk written as "deValk," and either the name was accidentally written on the passenger list without the final "k," or else the ink has faded enough that it doesn't appear. My grandfather had told me the story that James and Barbara had immigrated to the U.S. with his mother as chaperone, married on board ship (apparently by the captain) and then married again in New York City. They then made their way to Rock Island, Rock Island Co., Illinois, where the Dutch community held a wedding party and/or gift shower for the newlyweds. However, in digging a little deeper, I discovered that Trijntje "Kate" Gerrits (DOLSTRA) VALK did not immigrate to the U.S. until 1888, and Rock Island County records show a marriage record for this couple. Apparently they did not marry on board, nor in New York City...I haven't found evidence for either situation; but then again, I haven't found evidence to dispute it, either. By using the Genlias, Tresoar, and also a municipal history and genealogy website, I discovered there was a DeJONG family in the village of Marrum, Ferwerderadeel (the municipal--or county--level), Friesland, the Netherlands, where Tjamme/James was born. The only Sjoerd or Sjerd DeJong I've been able to find was old enough to be Berber/Barbara's grandfather, and I cannot find a man by that name who is likely to be her father. 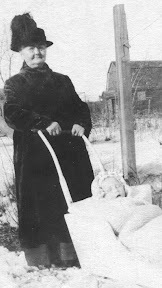 James and Barbara had a number of infants that did not live, and using the Dutch system of naming, attempted several times to name baby girls for James' mother, as well as using the name Jennie several times before they had a daughter that lived. They also had a daughter named Geertje/Gertrude. Following the Dutch naming system, my theory is that Barbara's mother was likely named Jennie (Janna, Jantje, or other Frisian-Dutch equivalent) and she probably had a sister named Geertje. That is the extent of what I know--or think I know--about Barbara's family. James and Barbara lived in Rock Island for about four years (1882 - 1886). They are not listed in any city or county directory for that area during this time. However, that is not so unusual, as immigrants and laborers often were ignored by city directory companies looking to promote names of potential customers for local businesses. While in Rock Island, they had four children: Chaterina T. (1883 - 1883); another Chaterina "Tryntje"(b. 1884); and my ancestor William James and his twin sister Jennie D. James (b. 1886). 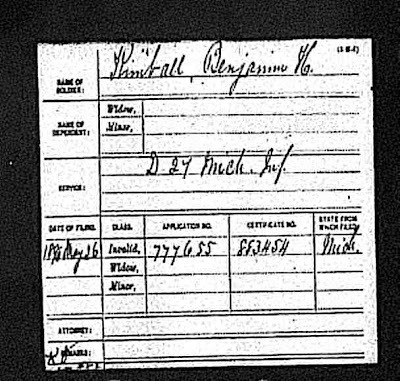 (I blogged about William's enumeration in the 1930 census here.) They moved to Holland, Ottawa Co., Michigan between August 1886 and April 1887, when Jennie died. The following year, another daughter, also named Jennie James, was born in their new location, Grand Rapids, Kent Co., Michigan. William's mother immigrated from the Netherlands and joined them. In 1890, Geertje "Gertrude" James was born; the following year, six-year-old Chaterina accidentally drowned. In 1895, a third Chaterina was born; she died four months later of "summer complaint," diarrhea in infants caused by spoiled milk. The following year, Tammie J. "Thomas" was born. He lived one year and died of measles. It really is heart wrenching to see how this family lost five of its eight children within 14 years, and yet this wasn't an uncommon occurrence at a time when poor immigrants did not have access to healthy living conditions and medical care, and in a day and age prior to simple antibiotics. Their three surviving children, William, the second Jennie, and Gertrude, lived into the twentieth century; William and Gertrude living into their 60s, and Jennie to the age of 88. 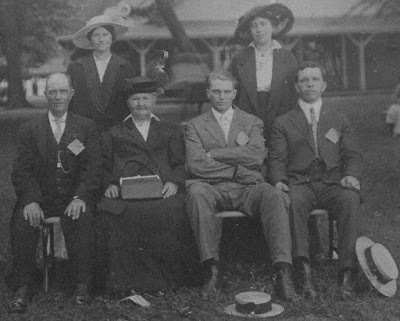 The photo below shows Barbara and James with their two daughters and sons-in-law at what looks to be some sort of lodge, church, or company picnic or outing, probably in Grand Rapids, between 1915 -1918. The date range has been determined by the date of Jennie and Gerrit HEIDEMA's wedding year and the year he passed away due to Influenza. The men are all wearing a badge on their left sides; if anyone recognizes what organization this is, please contact me. I find this unusual, because the Dutch Reformed Church, of which this family were members, frowned heavily and preached strongly against fraternal organizations. Missing from this photo is my ancestor, William. Perhaps he was the photographer. Front, left to right: James and Barbara; sons-in-law, Gerritt John HEIDEMA, Sr. and Jacob YSSELDYKE. Back, left to right: daughters Jennie and Gertrude. Household 255, Family 267; Valk, Barbara; Head of household; owner of home worth $3500; No radio; Female; White; Age 71; Widowed; Did not attend school since 1 September 1929; Able to read and write; Born in the Netherlands; Parents born in the Netherlands; Language spoken before coming to the United States: Dutch; Year of immigration: 1890 [sic]; not naturalized; able to speak English; Occupation: none. Barbara died of valvular heart disease and dropsy at her home on 1 June 1934. She was buried in Greenwood Cemetery in what was then Walker Township (now part of the City of Grand Rapids), Kent Co., Michigan next to James and his mother. Their graves were the first ancestral ones I ever visited, in October 2000. "It never rains, but it pours." I imagine most genea-bloggers are like myself; I go through these dry spells where I can't think of anything to blog about, or can only think of topics that don't seem interesting enough to mention. And then there are times like the past two days, when so much happens so fast that there simply doesn't seem time enough in my day to blog about them all! So I will have many exciting things to share about the next few days. 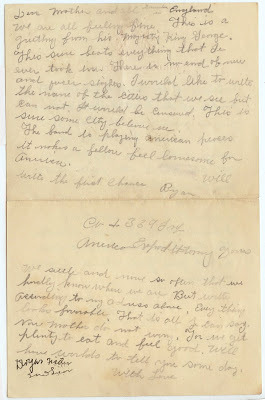 I'm still continuing blogging my great-grandfather's World War I memorabilia; I have another "My Ancestors in the 1930 U.S. Federal Census" post in the works; there's plenty more about Footnote.com and the great finds there that I'm excited to be sharing; the Eastern Washington Genealogical Society has three bits of terrific news; I made some new discoveries at two local Family History Centers yesterday...and I had a great interview with Jeff Harmon of MemoryPress today! Jeff works with a small start-up company in Utah that has just released a family history project that will be of interest to family historians and genealogists. MemoryPress is a start-to-finish solution to publish your Personal or Family History into a beautiful hardbound book. Online Collaboration—kind of like Google Docs, MemoryPress lets you collaborate online, but to create your family history. REAL Typesetting —powered by TeX, MemoryPress easily organizes and typesets up 480 page books online! To our knowledge, this has NEVER been done online before. Really Long Lasting Books—When you print your family history stories you want them to last. Watch what happened when we put a MemoryPress book in the dryer for 45 minutes. Customer Phone Support—Creating a book can be difficult for the non-tech savvy user, it can be difficult to learn drag-&-drop, uploading photos, etc... They can give us a call and we will step them through it at no extra charge. MemoryPress' purpose is to publish Family History books (baby, wedding, memorial, biographies, etc...), archiving them online and making them search-able, while publishing them into traditional book form. When I first heard of this product, I wasn't sure that this was something I would want to do right now. After all, I'm a pretty busy gal! While I am working towards gathering resources for an eventual published Hoekstra Family History, I am nowhere near being prepared to start publishing. But then, as I looked over the products, I thought of my 20-year-old wedding photo album I had put together in one of those (yikes!) nasty magnetic-photo page albums...you know, the one with the archivist's nightmare of acidic plastic pages that slowly (and sometimes quickly!) eat away at your photographs? Yes, that one! I thought this would be a great opportunity to redo my wedding album and save the photos for posterity. Not only do I have many color prints, but also some special black-and-white photographs that I could incorporate into a stunning book along with our written memories! Now I have to say that first of all, the technological support at MemoryPress is fabulous! I learned this the hard way as Jeff was guiding me through the various fun features of the online creation of a sample book. We both had lessons in patience as first my laptop was having issues displaying photos I attempted to upload, and then my desktop lost Internet service. After waiting out these snafus, I had no problem viewing, uploading and playing around with the text and graphics of the sample book on my desktop. This is not to say that MemoryPress won't work with your laptop; Jeff assures me that the program adjusts to both huge or tiny screens. I have an industrial-grade, rather than a commercial-grade laptop, so occasionally problems show up with this machine that I'm sure are unique only to this product. The friendly, patient, helpful service was a wonderful example of the support customers are certain to receive from this company! I can hardly wait to get started, and I'll keep you posted on my progress! In establishing some more of the characters that will be appearing in the documents and letters of William Bryan ROBBINS, Sr.--my great-grandfather--during his service in the American North Russian Expeditionary Forces at the end of World War I, I have posted some photographs of him and his sweetheart, Marie LEWIS, which I recently received from my aunt, as well as a photo of her parents. According to my grandfather, his parents Bryan and Marie met while Bryan was chauffeuring during the funeral of Marie's maternal grandfather, John WILKINSON, Sr. John's burial occurred 14 September 1917 at Oakhurst Cemetery in Whitehall Township, Muskegon County, Michigan. His daughter, Mary J. WILKINSON, her husband George Emmett LEWIS, and their 10 children were living in nearby Muskegon Heights at that time. This was around the same time period that Angelo and Lula ROBBINS and their four sons moved to Muskegon Heights from Ensley Township, Newaygo County, Michigan. This just leaves a lump in my throat! Thankfully, Bryan made it safely home, or else I--and all their many other descendants--would not be here today! I just received Footnote.com's first-ever monthly newsletter in my e-mail inbox a few minutes ago. It lists what's happening at Footnote, including recently added titles of collections, new titles coming soon, and titles they're still working on. They mention that they have a Seven Day All-Access Free Trial Membership in effect; for more information, click here. They list new and improved features of the site, including Spotlights, Title Information Pages, Original Documents Page, and the Image Viewer. There's a Name the Newsletter contest, and a juicy tidbit that more World War II documents will be arriving soon! So how do you sign up to receive the monthly newsletter? My guess is that you simply need to sign up to become a free member by going to their home page, http://www.footnote.com , and clicking on the "Become A Member" link in the upper right-hand corner. You can sign up for the Free Footnote Membership, or try out their Seven Day All-Access Free Trial Membership. Although I do have an All-Access Membership, even if I did not, I would sign up for the freebie or trial version to receive the newsletter. I've done this for several genealogical subscription websites that offer newsletters with their freebie plans. Some of them don't currently offer databases that pertain to my research, or I don't see much that holds my interest. But by being on their mailing list, I'm alerted to updates on data that may interest me, or learn about short-term free trial periods or database access. Now, Footnote is not one of those sites that doesn't offer me much or leave me somewhat disinterested! Although it took me a while to warm up the website, mainly because I was ignorant of the scope and depth of their content, now I'm a confirmed addict. In the coming days, I'll share with you some of the documents I've found on my ancestors, and even give comparisons as to the quality and breadth of the records in contrast to what other similar genealogy websites offer. I want to set the stage, so to speak, of the family that my great-grandfather William Bryan ROBBINS, Sr. grew up in, before posting some of the documents, letters, and photos from his World War I service. 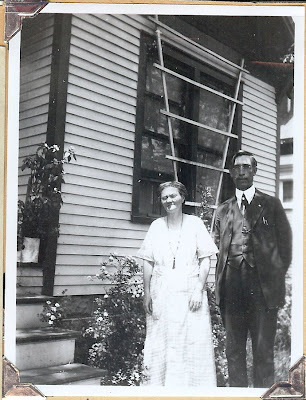 The photo below is of his parents, Mary May KIMBALL, also known as Lula or Lulu WEAVER, and Angelo Merrick ROBBINS, Sr. Click on the links to read the AnceStories (biographies) of each for more background on this family. This photo, recently sent to me by my aunt, is the only one I have of my great-great-grandfather, and I know of only one other, which is probably in the possession of my paternal grandmother. In that particular photo--a formal portrait--Lula and Angelo are surrounded by four of their sons, Lloyd (b. 1894), dressed in his World War I uniform; my great-grandfather Bill (b. 1896); Angelo Jr.--"Angie" (b. 1904); and Don, the surprise baby (b. 1914). It was obviously taken right before Lloyd went over to France to fight with the 32nd Division of the U.S. Army, in a machine gun corps, probably in 1917. At that time, their eldest son, Floyd (1893 - 1916), was deceased (the family story says from eating wild mushrooms; his death record states from pneumonia). Their only daughter Reva (b. 1898) was institutionalized at Traverse City State Hospital for mental illness; she committed suicide there in 1926. Lula and Angelo also had a stillborn son in 1906. Below is a contract of a promise of labor between Bill (Bryan--he went by either) and his eldest brother, Floyd, on March 8, 1915. 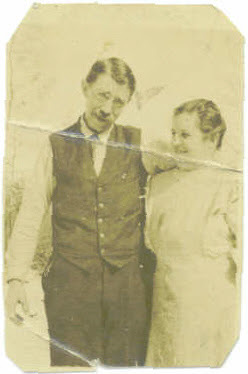 At this time, Floyd was a married man, having married Flora LIEFERS the previous year. What's interesting to me is all the family signatures on the back page. 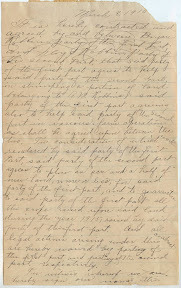 It is hereby contracted and agreed by and between Bryan Robbins, party of the first part, and Floyd Robbins, party of the second part, that said party of the first part agrees to help said party of the second part, in stumping a portion of land belonging to A. M. Robbins, said party of the first part agreeing also to help said party of the second part in various farm operations as shall be agreed upon between the two. In consideration of which work rendered by said party of the first part, said party of the second part agrees to plow an acre and a half of new land, more or less, for said party of the first part, and to guarantee to said party of the first part all the crops raised upon said land during the year 1915, raised by said party of the first part. And all legal actions arising under this contract are hereby waived by party of the first part, and party of the second part, respectively. For witness whereof we are hereby sign our names this eighth day of March, 1915. This contract doesn't say where this takes place, but I have documents verifying the family's residence in Ensley Township in Newaygo County, Michigan from at least 1906 through 1914, so likely this is still Ensley Township. The fact that the contract mentions farm work backs up my theory that this is a rural area, rather than urban. 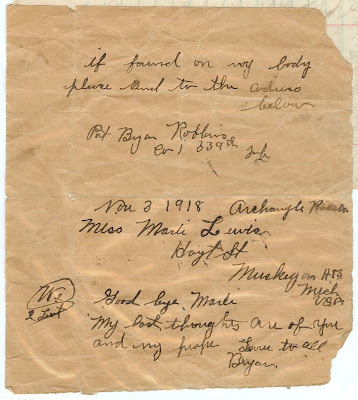 Floyd died 4 April 1916 in Ensley Center; the family was next found residing in Muskegon Heights, Muskegon County, Michigan as early as 12 September 1918. This has been a red-letter day in my genealogy calendar! 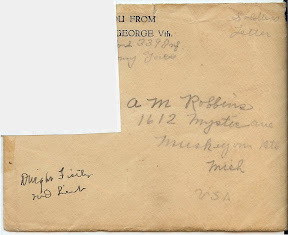 I wrote in my last post of how I received a package of three CDs of scanned documents, photos and letters from scrapbooks belonging to members of my Robbins family--especially the memorabilia from my great-grandfather's World War I service. I received a letter from my mother's sister with some copies of commendation letters to my (step) grandfather DeVries for his many years of service in the U.S.P.S., as well as the obituary of my great-grandfather Hoekstra's second wife. AND, I received an e-mail from my mother's cousin with a copy of the death certificate of my 3rd-great-grandfather, Jan Martens HOEKSTRA. His anglicized name was John Martin HOEKSTRA, the same as his grandson/my great-grandfather. I have been trying for several years to figure out where exactly Jan was buried. 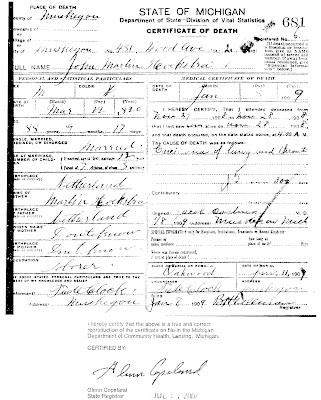 Our Family Record book, filled out by my Hoekstra great-grandparents, says he was buried in Muskegon, Michigan, which makes sense, since he lived there the last 14 years of his life, and I found his death record in the Muskegon County death libers (these county death records do not list cemetery information). But the Muskegon County Cemetery Records I ordered on microfiche did not list him, so I could not find the specific cemetery he was buried in. His wife, my ancestor Grietje JONKER, was buried in Pilgrim Home Cemetery in Holland, Ottawa County, Michigan, and the information in those records made it clear he was not buried near her. I have suspected for some time that the Muskegon County Cemetery Records which I viewed on microfiche, published by the Muskegon County Genealogical Society, were created from tombstone transcriptions, and not necessarily from cemetery office records. Family records of other ancestral lines residing in Muskegon County mentioned burials of individuals in Muskegon County cemeteries not listed in the published cemetery records. I figured that ordering a death certificate would give me the name of the cemetery, but that was further down on my list of records I needed to order. Thanks to Mom's cousin Kathy, I now have my own copy. As you can see by clicking on the image above for a magnified view, Jan was buried in Oakwood Cemetery. There are two cemeteries by that name in the county; one in the city of Muskegon, and the other in Holton Township (often referred to as Holton Cemetery, or Holton/Oakwood Cemetery, to distinguish it from the one in the city of Muskegon). 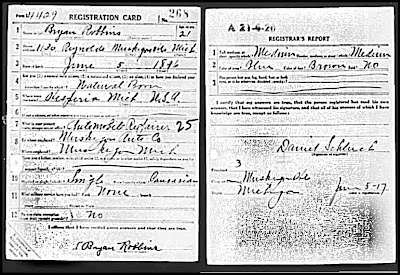 Using the logic that he lived and died in the city and that the family records stated he was buried in (the city of) Muskegon, I conclude that the death certificate is referring to Oakwood Cemetery in the Muskegon. I did a search in the online cemetery listings, using Google, as the site does not have a search engine, and still came up without any listings for Jan or John Hoekstra. So while I don't have a specific lot number, I do have evidence of his burial ground. I will be contacting the cemetery office soon to see if I can determine his exact burial place. I also have the name of the undertaker, which may lead me to a funeral home that can verify the body was disposed of at that cemetery. Today I received a surprise in the mail: three CDs' worth of scanned pages and photographs from the scrapbooks of my paternal grandfather's sister. It is a treasure trove, and I am absolutely giddy over it! There is a large collection of letters, documents and photos from my Great-grandfather Robbins' service in the American North Russian Expeditionary Force during and shortly after World War I. I will be sharing these treasures with my readers in the near future, and to give you background, I encourage you to read his AnceStory (biography) here. I am also posting an article below which I submitted to the Eastern Washington Genealogical Society's 2005 literary contest "My Favorite Military Ancestor," for which I won a second-place prize of $50 towards purchases at my favorite genealogical publishing company. This should give you a better idea of why American forces were in North Russia (and Siberia)...a fact that the U.S.S.R. used against us in their history books during the Cold War. After all, we had invaded them once; why wouldn't we do it again? It was a humid night in Western Michigan, and the stars and fireflies twinkled over the yard of my great-grandparents’ home where I stood on a small statue of a polar bear. My 10-year-old cousin scolded, “Don’t stand on that! It’s Grandpa’s!” The “grandpa” mentioned was his grandfather and my great-grandfather, William Bryan Robbins, who had recently passed away. It was 1972, I was five years old, and although it was a time of sorrow for many family members, it was a time of magic for me. Just a few days earlier, I had flown 3,000 miles with my parents from our small Alaskan village, population 300, coming into a breathtaking view of Chicago at night, a scene I would never forget. At our journey’s end, my grandfather met us at the airport in Grand Rapids. We drove 35 miles west to tiny Conklin and pulled into the driveway of my great-grandparents’ home. Grandpa said, “Now there’s Great-grandma. She’s feeling sad today, so give her a great big hug.” I flew out of the car, and running across the yard to where my petite ancestor sat, I surprised her with the biggest embrace my small arms could manage! Although our time in Michigan created memories that I still look back on with fondness, I unfortunately have none of the man whose funeral was the purpose behind our trip. I had seen him on two previous visits, but was too young to remember the lean, gray-haired man with an affinity for his pipe and the Robbins’ trademark storytelling. Nor did I have any clue of the significance of the statue in his front yard. Born 6 June 1896 in Hesperia, Michigan, William Bryan Robbins was named for the silver-tongued presidential candidate, William Jennings Bryan. Also known as “Bill” or “Bryan”, he was the third of seven children of Angelo Merrick Robbins and his wife, Mary May “Lula” Kimball. Because Angelo was a schoolteacher, the Robbinses lived all over Newaygo County, wherever a teaching position became available. It wasn’t until 1906 that the family settled in Ensley Township for ten years. Although Bill never attended a higher institute of learning, he continued to educate himself by helping his father study for his annual teaching certifications. As Bill became a young man, the political climate in Europe geared up for World War I. There were also changes at home. After Bill’s oldest brother died in 1914, the family moved west to Muskegon Heights, a growing community situated three miles inland from Lake Michigan. Here Angelo ended his teaching career and became employed at a nursery, while Bill found work as a chauffeur in the new age of automobiles. One fall day in 1917, Bill was hired to drive a hearse for a funeral. Among the mourners was a blue-eyed, four-foot-eleven, 15-year-old, Marie Lewis. It must have been love at first sight, because they began a courtship that lasted two years. 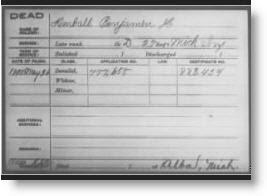 Bill’s older brother, Lloyd, was already serving in France with the 32nd Division in a machine gun corps. So, joining the patriotic spirit that was sweeping the nation, Bill enlisted on 23 June 1918 to begin an unforgettable year in a forgotten expedition in American history. Like most wars, the events in Northern Russia in the early twentieth century had multiple complicated causes. At the beginning of World War I, Russia was one of the Allies, but was undergoing internal turmoil between the Czarist monarchy, the Provisional Republicans (a democratic party known as White Russians), and the Bolsheviks. When the communists overthrew the Provisional government that succeeded the monarchy, they signed an armistice with Prussia, switching sides mid-war. The Allies were horrified, realizing the enemy could now relocate troops to the Western Front, gaining a three-to-two advantage. The U.S. could also lose a fortune in munitions and foodstuffs it had stored at Murmansk, North Russia, originally intended to help the Allied cause. Things changed when the Bolsheviks realized that they had the disadvantage in their armistice with Prussia, and appealed to the Allies for assistance. Britain saw the opportunity not only to re-establish the Eastern Front, but also to colonize the area. Immense pressure was put upon President Wilson to supply American troops for the expedition, since most British troops were occupied in Western Europe. Ostensibly, Americans were sent to Russia to defend their munitions from Axis takeover. The truth is, the weapons had long been “requisitioned” by Bolsheviks by the time they set foot on Russian soil; and the next 17 months would be a senseless waste of American lives for a purposeless and futile campaign that rivaled the wars of Southeast Asia half a century later. Bill Robbins’ basic training took place at Camp Custer, Battle Creek, Michigan. He was assigned to Company I of the newly formed 339th Infantry of the 85th Division, later nicknamed the “Polar Bear Division,” because of its service in the American North Russian Expeditionary Force (ANREF). But Russia was the last thing on these Michiganders' minds that summer of ’18. They believed they would join their brothers in the trenches of Western Europe. Leaving in late July, they made their way by train and ship to the south of England, where they had the bad luck to be stationed at the wrong place at the wrong time. General Pershing felt he could not spare any of his troops from France, so he chose the 339th to be assimilated into British schemes. The Americans were re-outfitted with British uniforms, rations, and supplies, which were of lowest quality. Antarctic explorer Ernest Shackleton had designed the outer garments of the uniforms. While constructed to keep out the cold, the soldiers’ safety and agility in battle had not been kept in mind. The overcoats were stiff and unwieldy, the boots’ slippery soles as useful as high heels on frozen terrain. The horrid rations consisted of ancient canned corned beef and seven-year-old frozen rabbit. Medicine was limited to iodine, quinine, and laxatives. The injury to insult was the replacement of reliable, U.S.-made rifles with the Russian Moisin-Nagant 7.62mm rifle, whose poor design and inaccuracy caused soldiers to describe it as being able to “shoot around corners.” Additionally, there was no scabbard for the bayonet, so it had to be permanently fixed to the rifle, making it only useful to roast meat over campfires! The 339th was sent to Newcastle-on-Tyne, where they embarked for an eleven-day voyage. This transport also included the 310th Engineers, the 1st Battalion, the 337th Ambulance Company and the 337th Field Hospital. The medical training of the latter consisted mainly of learning how to roll bandages. Medical supplies had purposefully been left behind in England to make room for crates of whiskey for British officers. Only a handful of first aid equipment was brought along by some American medics. On their route through the North Sea, influenza took hold, due to one of the ships not being disinfected after its last trip on which it had carried many deadly cases of the illness. Several men died enroute and were buried at sea. When the ships arrived at Archangel on September 7th, a large number of soldiers were ill and had to be quarantined in makeshift hospitals. Four weeks later, the flu ran its course with nearly 100 young men dead and buried in a new cemetery in Archangel. Bill also became ill, but refused to seek medical treatment. He knew that in the contagious atmosphere of the infirmaries his chances of survival were slim. He recovered and was sent to the Railroad Front. Archangel was then a city of 40,000 inhabitants, located where the Dvina River flows into the White Sea. The surrounding 250,000 square miles are nothing but swampland, with only stunted pine forests breaking up the monotonous landscape. A railroad stretched southward to Moscow for some 900 miles. Several companies, including Company I, were stationed at the Railroad Front, an area of about 125 square miles encompassing both sides of a 17-mile stretch of railroad. Encampments were made along the railroad, and these outposts were defended, along with French troops, from the Bolsheviks (“Bolo”). Besides the French, there were also British and Royal Scots, Italian, Canadian, and Serb troops spread across the province. All were placed under British command; lower-ranking British officers were given authority over other high-ranking officers. The Americans got on well with the other troops, except for the Brits. Unfortunately, the British took advantage of the Americans, even confiscating food, supplies, and gifts sent to them. Many soldiers had to pay to receive goods sent by their own families! Additionally, some in the service organizations stationed in Archangel also joined in to profit in this unethical manner. Bill recalled that he purchased a sweater from the YMCA, which had been made and donated by citizens back home. The Americans were paid in worthless British script; Bill ended up giving away his to a peasant when he left Russia. The American troops received no help from their superior officers in these matters. ANREF commander, Colonel George Stewart, abdicated his authority to the British command and would not interfere to assist his men. To make matters worse, the major in charge of the 339th was a drunken incompetent. He would send his companies after the enemy without proper intelligence or maps. If they failed in their missions, he would blame them. He so infuriated the enlisted men that he was in danger of losing his life. Bill recalled later some of the men shooting at the chimney of the major’s building to scare him into going back from the front. The saving grace in this situation was the lower-ranking American officers, who did all they could to ease the load of those under them, taking part in their privations. These men often risked receiving reprimands from their superior officers as they defended the enlisted men in courts martial, or refused to obey orders that unnecessarily risked their men’s lives. Above and beyond all obstacles was the climate, worse than the enemy himself. With the winter of 1918-1919 being one of the coldest on record, the thermometer plunged to 60 below zero. Bill once told how the men would sit on frozen, snow-covered logs near the campfires while they warmed themselves. When the spring thaw hit, they discovered that some of the “logs” were actually corpses! With inadequate clothing and lack of food, the troops looked to the peasants’ ways to survive. They discarded the cumbersome boots for fur moccasins, trapped rabbits, shot wild birds and used grenades to blow fish from the frozen rivers to eat. Always they must stay on the lookout for terrorist attacks. Like the wars in Korea and Viet Nam, our troops could never be sure who was enemy and who was friend. Meanwhile, the families of the ANREF were appealing to their Congressmen. The Armistice, signed on November 11, 1918, had ended World War I, but their sons were still fighting what seemed an endless war. Finally, an Act of Congress brought the Polar Bears home. Beginning June 3, 1919, the first of the troops shipped out of Archangel for Brest, France. On June 21st, they boarded the S.S. Von Steuben for their final voyage home, arriving in Detroit on July 3rd. Orders to form ranks and march down the street were disregarded, as families mobbed the platforms to embrace loved ones. 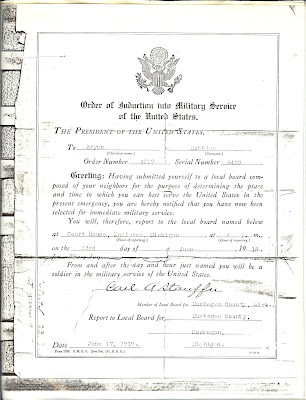 On July 7th, the Force demobilized at Camp Custer and headed home. Bill received his discharge pay of $284.45. He was fortunate that he was never wounded, and although he did not receive any medals, he was issued a Bronze Victory button. One hundred twenty-one American dead were left behind in Russian soil for another ten years, until a search party returned with the remains of eighty-six. As for Bill, he married sweet little Marie whose letters sustained him during the bitter hardship of the north. They were wed Christmas Day 1919 and became the parents of five children. All three sons served in World War II: two in the Army Air Corps, the other in the Navy. Bill’s years after the war are another story; but when he passed away on 6 August 1972 in Grand Rapids, he was survived by his wife of nearly 53 years, five children, ten grandchildren and eight great-grandchildren. As I stood at his grave in Coopersville Cemetery, Ottawa County, Michigan for the first time in October 2000, I marveled at the obstacles this man had overcome thousands of miles away, and I felt proud to be his descendant. Truly, William Bryan Robbins, Sr. is one of my favorite military ancestors!